Pregnancy is a wonderful time in a woman's life - a challenging and even magical time. Regular physical activity during pregnancy can help you get through it more comfortable, with fewer health concerns or problems. The purpose of training during pregnancy is to maintain some of your fitness. It is not a time to try and increase your aerobic capacity or your muscular strength. Helps prevent excessive weight gain. Helps you cope better with labor. Boosts your general sense of well-being and energy levels. Decreases the risk of gestational diabetes, hypertension, and postnatal depression. Decreases constipation and helps ease lower backache. Makes weight loss after the birth of your baby easier. 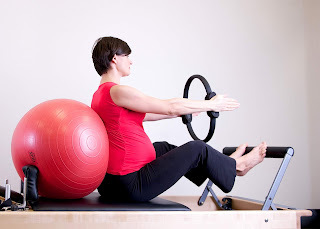 Though we can do exercises during pregnancy like swimming, station cycling, brisk walking, low impact aerobics, moderate strength training, yoga, and pilates, you must notify your fitness instructor of your pregnancy, as certain positions and movements should be avoided. Always remember to warm up and cool down before and after every session; not overexert yourself, to prevent your body from overheating; drink plenty of water to stay hydrated during exercising, and not do exercises requiring you to lie flat on your back from the second trimester onwards. No matter which activity you choose to do, being strong physically reflects on your mental strength and makes you stronger in many aspects of your life - so, be strong and keep doing what you're doing.